Brew City MKE was an exhibit presented by the Milwaukee County Historical Society (MCHS) on the history of brewing beer in the Milwaukee Area. Brewing was the industry that made Milwaukee's economy boom and become well-known across the country. The Milwaukee County Historical Society created this site to bring this hometown exhibit to you year round in addition to a Milwaukee exclusive beer bar. Come see and taste Milwaukee innovation and it's History on Tap! Admission to our Milwaukee Brewing History Museum INCLUDES a Milwaukee Tap Beer or Sprecher Craft Soda from our Milwaukee Exclusive Beer Bar! Enjoying your beer while exploring the Museum is encouraged, and is part of your interactive experience. Once finished, you will no doubt be thirsty again, feel free to visit and hang out in the beer bar for more! Take advantage of our location downtown at the Shops of Grand Ave Mall with their own parking structure, keep your ticket upon entry and ask the Visitor Assistant up front or your Bartender for a discounted parking sticker of $3 for 3 hours. We are located at the Main Entrance Atrium of the Shops of Grand Ave where Old World 3rd Street meets Wisconsin Ave. Provide proof of your admission purchase to the Visitor Assistant at the entrance, and you will be on your way to seeing and tasting Milwaukee Brewing History! Keep your receipt to show proof of purchase to your bartender as well as for you to also visit our parent site the Milwaukee County Historical Society a short 3 blocks down Old World Third Street! Head on down to the Milwaukee Beer Bar to taste and choose your included tap beer or craft soda, and then head on in to the Museum, either behind the bar through the saloon style doors, or where you entered near the Visitor Assistant, and up the ramp. You may of course choose to explore the Museum before your beer or soda, and may redeem this at any time during your visit, just show proof of admission purchase to your bartender. The self-guided tour time of the Museum is decided by your own interest, anywhere from 30 minutes to skim read the provided information on the panels to 90 minutes to read all of the intriguing Milwaukee Brewing History. Once you have finished pursuing the Museum you may enjoy the beer bar as long as you would like. There are many delicious and great styles of Milwaukee beers to try by way of our Milwaukee Exclusive curated beer list, so tuck in and enjoy! 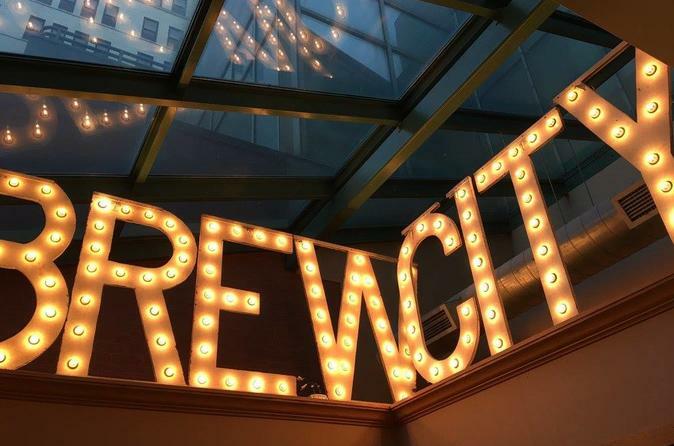 We do not have a food menu, but we have tasty Milwaukee Bar snacks such as Sprecher Beer Chips, Beer Popcorn, and Root Beer Popcorn as well as Gardetto's and Pretzilla Pretzel Bites with Cheese. You are welcome to bring in food from other establishments of which there are many near by downtown, and on the 1st and 3rd floor food court of the mall. We also provide a book of menus for you to order in house if you prefer.